It's been rumoured for a while that BlackBerry is going to make the jump to Android with a high-end smartphone to revive the company. Well, this could be our first look at said phone, and what a first impression it's made. Courtesy of notorious leak artist Evan Blass aka @evleaks, we've got what appears to be our first look at BlackBerry's first Android smartphone which is codenamed Venice, and we're loving it. The fresh render appears to show a display with two curved edges, just like the Samsung Galaxy S6 Edge. It appears to be running full Android and there's a load of core Google apps like Chrome, Maps, Drive and Picasa, meaning users will have access to everything in the Google Play Store. As hardware goes, the Venice appears to have a single front-facing speaker below the screen. Then there's a Micro USB port and a 3.5mm headphone jack below. But what isn't shown off in the render is the slide-out keyboard that we've heard so much about over the past few weeks. We're hearing that it will launch on the AT&T Network in the United States, but there's no doubt it will be released in other markets as well. Recent rumours have suggested the Venice would offer a 5.4-inch QHD display, a Snapdragon 808 processor and 3GB RAM. The spec sheet also suggests a 18-megapixel front having camera and a 5-megapixel front-facing camera. There's also mention of a second Android phone; a low-end handset codenamed Prague that will come out in August, a few months before November when the Venice is thought to arrive. Last week BlackBerry CEO John Chen said that Google must improve the security of its Android OS before the company could move forward. Going from this picture, that's all been sorted. 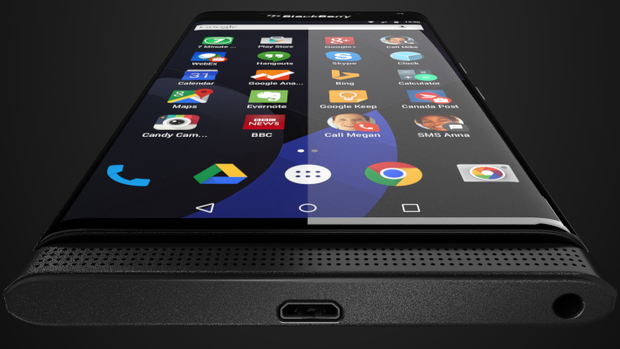 What are your thoughts on the Android-running BlackBerry Venice? Yay or nay? Share your thoughts in the comments or at the T3 Facebook page.